There are lots of parenting moments I expected to have. I figured I'd help my kid learn to walk and talk and read, how to go in the potty and play well with others. Later I'd help her navigate puberty and prom and college applications. And it seemed like there was always some book or article that would help me through whatever frequent gap of knowledge or skill that lay between me and successful, or at least acceptable, parenting. I even understood that the time would come when I would need to coach my daughter on how to drink. I mean, most people do drink at some point in their lives. I had no illusions that Kate would be the exception. And I actually found several solid resources to help me through this challenging late-stage parenting moment, just like I had with most of the others. Now I'm not talking about doing anything illegal, or teaching my daughter how to party. But there are some rules that apply to the art of drinking, and some painful experiences that go along with breaking those rules, that I hoped I could save my daughter from. This required a certain amount of honesty about my own mistakes. But as my daughter left her teens behind, I found myself faced with one last frontier of parenting that never occurred to me. 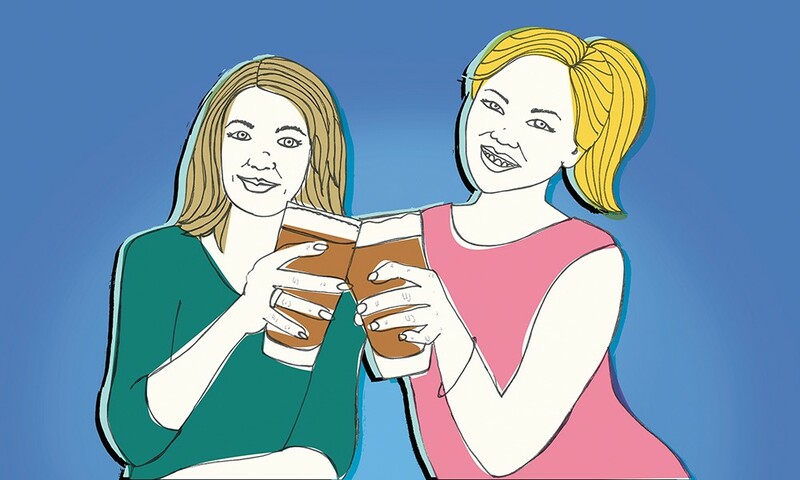 How do I drink with my daughter? Most of the other parenting milestones have involved me passing on wisdom or leading the way. But this was new territory, territory I was forced to cross early when my daughter chose to attend college in Europe. Although she still can't legally drink in the U.S., she's considered an actual adult in Europe, which sure takes the wind out of the sails of the American tradition of the 21-run. But this moving target of her adulthood felt pretty theoretical until last spring, when we visited her in London. We wanted a "proper" pub experience, so Kate and her boyfriend took us to one of their "locals." The place was old, and full, and at first it seemed not that different from an American bar. People were playing pool, the music was loud (and mostly predated the customers in the pub) and the TV over the bar was playing sports. But here's what was different: Kate bought the first round. She walked up to the bar, ordered pints for everyone, and brought them back to the table. We raised our glasses, toasting our time together, and took a sip. And as I looked over the rim of my glass, I had a sort of surreal moment: I was drinking with my daughter. In public. Legally. My daughter is 20, and if she was in the U.S., I would still have one last rite of passage to see her through; I'd still have one more year before she was officially and irrevocably an adult. I thought I still had that time. But while I was clinging to Kate's last moments of being a kid, she was miles ahead of me in her new life as an adult.